We’re always thinking, even when we don’t think we are. Our brains are constantly working to solve problems, to remedy issues or mental conflicts, consolidating information, and processing new knowledge or stimulus. Our brains function in ways we can’t consciously comprehend, always doing something behind the scenes. By becoming more in-tune with our personal thinking patterns we can develop healthier habits of creative and productive thinking. If you tend to think of unique ideas when you’re surrounded in a noisy room by strangers, it’s powerful to know why that is so you can recreate the stimulus more of the time. Or if you find yourself struggling to feel motivated whenever you’re at home, figuring out why that is can help you change the environment or create different types of motivators there, and elsewhere. Building self-awareness isn’t always as easy as it may seem however. There isn’t a silver bullet to self-awareness, but there are ample things you can do on a daily basis to build awareness of your own thinking. In her book Insight, Tasha Eurich dives into the research around why self-awareness is so foundational to performance, decision making, relationships and creativity. She also uncovers a number of exercises you can do to improve how you think about your own thinking. 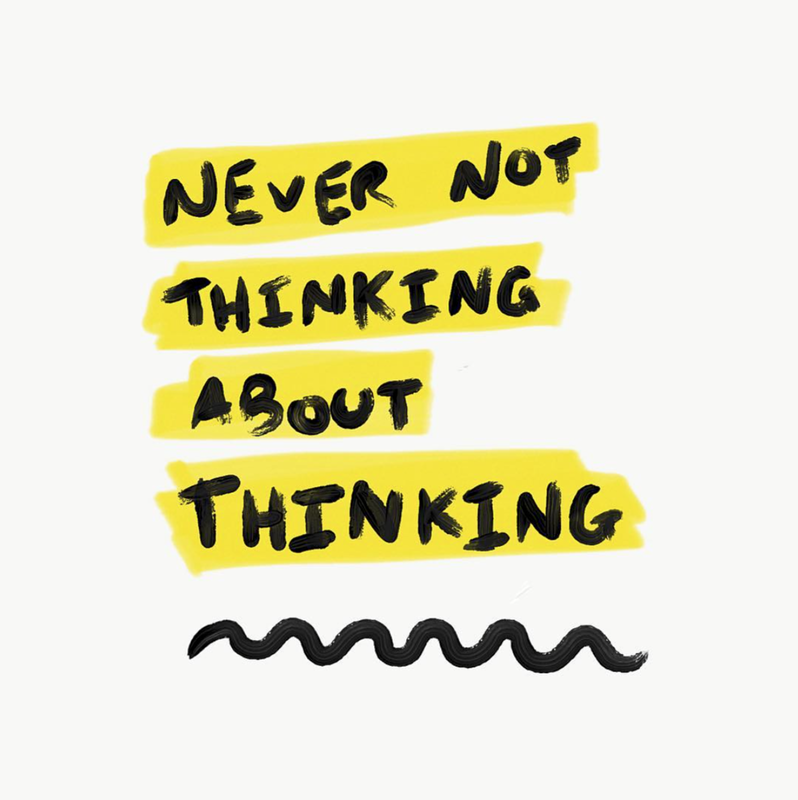 Meditation, occasional free-writing or journaling, reading, daily check-ins, trying new things, and having regular conversations with a good friend, are all great ways to become more aware of your thinking patterns. With mindfulness meditation the goal is to sit silently with yourself for anywhere from 10 minutes to an hour or more. No music, no direction, just sitting with yourself and learning to observe where your thoughts go. It’s amazing when people first start meditating like this. I’m often told by those just starting to meditate: “My thoughts jump all over the place! I can’t control what I’m thinking.” And that’s the whole point of this type of meditation practice, you’re not supposed to try and control your thoughts, you simply need to be aware of where they come from, how long your mind tends to sit on any particular subject, notice if there’s anything surprising or recurring in your thoughts that might need more attention when you’re done with the meditation practice. Free-writing or journaling also helps you become more aware of your thinking patterns, but in a way you can come back to later on and be more reflective of. The trick, as Eurich explains in Insight, is to not spend too much time being reflective or focusing on negatives in your life. A good way to keep journaling beneficial is to use prompts to help focus your thinking as you write. You can find a ton of free resources online for daily writing or journaling prompts. If you have an iPhone or iPad I built a free app for creative writing called Prompts. Eurich gives a few other exercises you can use to become more self-aware, including what’s known as the Miracle Question: imagine while sleeping tonight a miracle occurs which influences many parts of your life. When you wake up, think about how you would feel and what would have changed. Or consider one of the best ways to gain awareness: ask someone you’re close to for feedback about you. What traits first come to mind when someone thinks about you? What do they view as your sentiment towards things, what are your regular habits or behaviors? When do you appear to be more creative or productive than not? We may not be able to fully control everything that goes on in our brains, but through building self-awareness and habits of thinking we can help encourage more creative output.